MisterChill doesnt provide products for the domestic market, which means we can specialise in providing you with a commercial ice machine to suit your needs. We have a wide range of commercial ice machines on offer, from supercubers to filters for sparkling-ice and ice-crushers - all at fantastic prices. If you choose a commercial ice machine from our range, you will receive a brand new machine, None of our machines are seconds or refurbished machines. 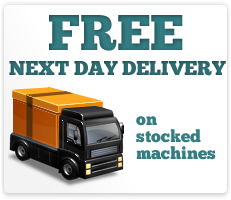 When you have decided on a product, all you need to do is place your order and we will deliver it directly to your door, normally within 5 working days if you happen to live in mainland UK. It couldnt be more simple. Once your commercial ice machine arrives, we wont charge you for installation, either - but if you should need instructions, you can download them here on our website. We make everything as simple as possible, so you can get your equipment quickly and efficiently.